Welcome to our new segment! We are going to let you know what’s going on in this busy town of ours in case you want to get out and about! There is absolutely no shortage of things this weekend so check it out below! Friday night the place to be is the Cam-Plex Heritage Center! Starting at 5:00 there is a reception for local artist Laura Chapman. Her art will be display in the gallery from today through March 9th with the reception kicking off the show. After the reception stick around for the Magic of Bill Blagg starting at 7:00. He’s in town for one show only so don’t miss it! You can go to Cam-Plex.com to purchase tickets for Bill Blagg. Saturday is jam packed with fun for the whole family from 10:30 to 3:00 downtown! Start with a visit to Teacher’s Corner Kid’s Mart from 10:30 for a meet and greet book signing with award winning Wyoming Poet Laureate Eugene M. Gagliano a retired teacher who published “My Teacher Dances on the Desk.” The book is a collection of children’s poems he wrote over the span of his 26 year teaching career. He will also spotlight his recently published “Is it True?” which is another book full of humorous children’s poetry. If you miss him downtown, he will be at the Campbell County Public Library at 1:00 in Pioneer Room 1 where he will be the guest of Prairie Pens, a local writing group. 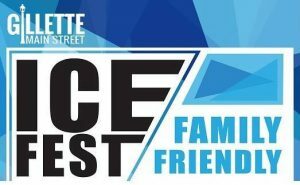 If you’re downtown for that, stay close because at noon the 4th annual Gillette Main Street Ice Fest kicks off! Other activities like a photo booth are available up and down the street. There you have it! That’s our round up of this weekend’s events! Have a great weekend all! I wanted to showcase local youth athletic schedules this week also but our internet isn’t cooperating so I’ll do my best to add those in for next week! In the mean time, if you do enjoy one of these events please be sure to drop us a comment about it and let us know what you liked best! !